This is a large tap and die set that overs virtually all threading chores for home-based or even small professional metalworkers. Several months ago when I reviewed the KD 40-piece Gearwrench Tap & Die Set I was impressed with the quality and function of the Gearwrench taps and dies. Since then they have performed perfectly in all normal drilling and tapping procedures in my shop. With that positive experience I decided to review the Gearwrench 114pc. Large Combination Tap & Die Set. This set is much larger and includes 96 taps and dies that cover nearly all of the thread sizes that we can reasonably expect to encounter in home-based or even smaller pro shops. This Gearwrench 114pc. Large Combination Tap & Die Set comes in a specially formed carry case that keeps all of the components organized and makes carrying this set around possible by one person. The case also makes it easier to see what components have not been returned to their spot so it is harder to lose pieces. You get 48 quality taps (left) and the same number of dies (right) in this set. The actual thread coverage for most users is impressive. In addition to the case you get a 7-1/2” and 14” ratcheting T-handles, small, medium and large tap adapters, large and medium die adapters, male and female extension 48 taps and 48 dies! To make the ratcheting handles compatible with your current tools they include a push button 3/8” drive adapter. For when confronted with a snapped off fastener they even include a 5-piece set of extractors! Coax out the busted fastener and you can use the appropriate tap to freshen the threads for the new bolt or stud. The included taps are 5/16 - 18 NC taper, 5/16 - 24 NC taper, 3/8 - 16 NC plug, 3/8 - 24 NC plug, 7/16 - 14 NC plug, 7/16 - 20 NF plug, 1/2 - 13 NC plug, 1/2 - 20 NF plug, 1/8 - 27 NTP, 4 - 40 taper, 6 - 32 taper, 8 - 32 taper, 10 -24 taper, 10 - 32 taper, 12 - 24 taper, 1/4 - 20 NC taper, 1/4 - 28 NF taper, 8 x 1.25 plug, 9 x 1.00 plug, 9 x 1.25 plug, 10 x 1.25 plug, 10 x 1.50 plug, 11 x 1.50 plug, 12 x 1.50 plug, 12 x 1.75 plug, 1/8 - 28 BSP, 3 x .50 taper, 3 x .60 taper, 4 x .70 taper, 4 x .75 taper, 5 x .80 taper, 5 x .90 taper, 6 x .100 taper, 7 x 1.00 taper, 1/4 - 19 BSP, 9/16 - 18 NF plug, 9/16 - 12 NC plug, 5/8 - 11 NC plug, 5/8 - 18 NF plug, 14 x 1.25 plug, 14 x 2.00 plug, 16 x 1.50 plug, 18 x 1.50 plug, 18 x 2.50 plug, 16 x 2.00 plug, 3/4 - 10 NC plug, 3/4 - 16 NF plug and 1/4 - 18 NPT. The included dies are 4 - 40 taper, 6 - 32 taper, 8 - 32 taper, 10 - 24 taper, 10 - 32 taper, 12 - 24 taper, 1/4 - 20 NC taper, 1/4 - 28 NF taper, 5/16 - 18 NC taper, 5/16 - 24 NF taper, 3/8 - 16 NC plug, 3/8 - 24 NF plug, 7/16 - 14 NC plug, 7/16 - 20 NF plug, 1/2 - 13 NC plug, 1/2 - 20 NF plug, 9/16 - 12 NC plug, 9/16 - 18 NF plug, 5/8 - 11 NC plug, 5/8 - 18 NF plug, 3/4 - 10 NC plug, 3/4 - 16 NF plug, 1/8 - 27 NPT, 1/4 - 18 NPT, 16 x 1.50 plug, 16 x 2.00 plug, 18 x 1.50 plug, 18 x 2.50 plug, 1/4 - 19 BSP, 9 x 1.25 plug, 10 x 1.25 plug, 10 x 1.50 plug, 11 x 1.50 plug, 12 x 1.50 plug, 12 x 1.75 plug, 1/8 - 28 BSP, 14 x 1.25 plug, 14 x 2.00 plug, 3 x .50 taper, 3 x .60 taper, 4 x .70 taper, 4 x .75 taper, 5 x .80 taper, 5 x .90 taper, 6 x 1.00 taper, 7 x 1.00 taper, 8 x 1.25 plug and 9 x 1.00 plug. Gearwrench even includes a set of screw extractors (left), thread gauges in SAE and Metric as well as a push button 3/"- square drive adaptor! the Pass-Thru ratcheting handles (right) and die holders make working on long stock simple. Despite the glaring difference in kit size the quality and innovative design of the Gearwrench 114pc. Large Combination Tap & Die Set remains constant. These are nicely designed and manufactured tools that worked perfectly throughout the evaluation. Use the proper size drill for the pilot holes and these taps cut easily and very cleanly. A handy drill and tap chart is included that provides the correct pilot hole size for the included tooling. 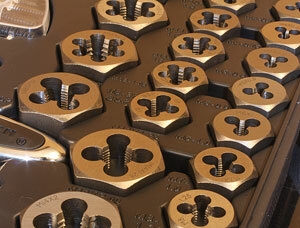 The dies also cut nicely and leave you with threads that accept nuts or screw into threaded holes smoothly. The ratcheting handles are very nice to use but can really make a threading job easier because of how quickly you can work around an obstruction. 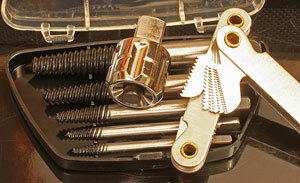 The ratchet means that you do not have to remove the tool from the fastener and then realign it to continue turning it. Along with the smooth comfortable handles the ratchet function just makes a lot of jobs easier and lets us focus more on being accurate. The ratcheting handles and die holders use the Gearwrench Pass-Thru system so you can cut threads down the full length of long bolts or threaded rods. This can some in very handy with studs and similar fasteners with long threaded sections. I spent the better part of an afternoon searching my woodworking and metalworking shop for thread sizes not covered in the Gearwrench 114pc. Large Combination Tap & Die Set. Despite a large selection of machines and tools this tap and die set can duplicate or repair every thread I could find. I know sooner or later you or I will need a different size and in those very infrequent situations buying a single, specific tap or die is way cheaper than trying to purchase a set that covers everything. The Gearwrench 114pc. 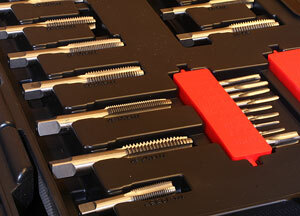 Large Combination Tap & Die Set is a very complete, well-made set that makes the precision task of threading easy. These tools are sharp and designed to function as we expect and leave smooth, strong threads. The size and shape of the ratcheting handles makes using them on even long jobs comfortable. 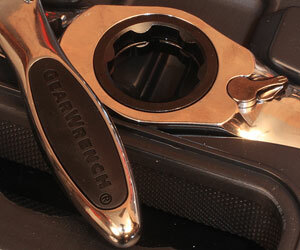 Despite the wide coverage range the Gearwrench 114pc. 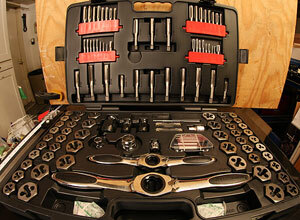 Large Combination Tap & Die Set has a street price of just $264.99. (5-30-2012) Considering the virtually “forever” useful life span with simple common sense care that puts the “per use” cost in the pocket change or less range.